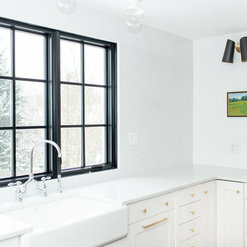 Mount Airy's Natural & Engineered Stone Specialists | Best of Houzz! Few things rival the simple elegance, natural beauty, and durability that granite countertops add to your home. Created by nature and refined by our craftsmen with modern technology, natural stone products are an investment that you will never regret! Deep iridescent colors and elusive beauty, that can only be found naturally in stone, creates an ambiance of formal sophistication like no other for any room in your home. 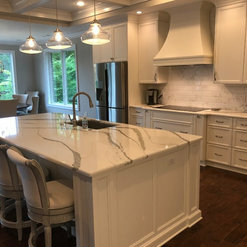 Founded in 2000, Johnson Granite, Inc., has grown from a small family-owned business with three employees to become a leading supplier of finely crafted natural stone countertops used by consumers who demand the utmost in quality and style. 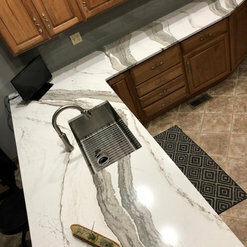 Dedicated to excellent customer service, high quality products, and ensuring that your project design is as unique as you are, makes Johnson Granite, Inc. the ultimate choice for creating unsurpassed beauty in your home. Visit the showroom at Johnson Granite, over 1500 square feet, showcasing the many facets of our craftsmanship. 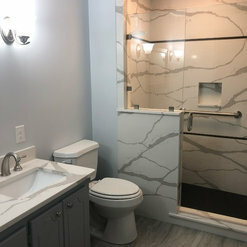 You can view the natural stone displays of our kitchen and bath countertops, tub and fireplace surrounds, shower displays, vanity and dressing room areas, and custom designed tables and floor inlays as well. 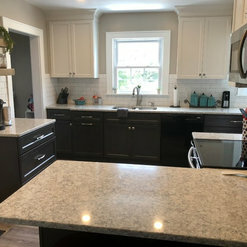 16 Projects for Johnson Granite Inc.
6 Reviews for Johnson Granite Inc.
Johnson Granite was the most professional and customer service oriented company we have ever dealt with. 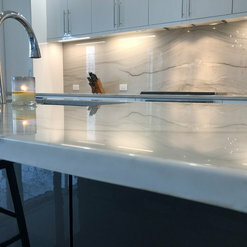 They were great to deal with from the first appointment scheduled with Abby to view the granite up until the granite was installed. Everyone we dealt with at the warehouse, during the measuring, and during the installation could not have been more friendly, knowledgeable and informational. They more than met our expectations in a timely manner. We highly recommend Johnson Granite to anyone looking for stone counter tops. We thank you for your business and especially for taking the time to review our services. We are happy you received top-notch service, as exceeding customers' expectations is our goal! 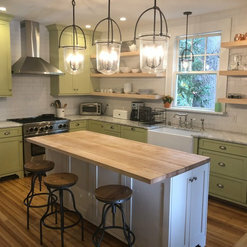 We hope you'll enjoy your kitchen remodel for many years to come! Johnson Granite provided exceptional service from beginning to the end of the project. Meredith, our sales associate, gave us wonderful advise, recommendations and selection of samples during the "stone" selection phase. 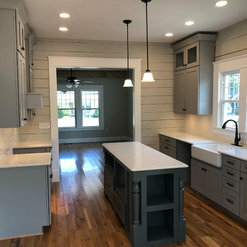 When it came time to measure the kitchen we were highly impressed with the professionalism of Richard, the technician and the laser based technology utilized to accurately measure for the counter tops and island. 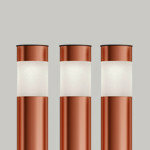 The measurements were immediately transferred to a computer enabling a visual impression of the finished tops design. Finally, Daniel and team, with equal professionalism and care, punctually delivered and installed the tops. Floors were covered to avoid damage during installation and care was taken with the "stone" to avoid possible damage to the supporting cabinets. The tops were accurately installed and where there were seams, these were executed remarkably making them virtually invisible ensuring a perfect finish to the project. We would highly recommend the Johnson Granite team. 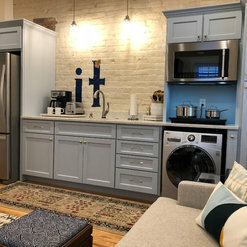 Your new kitchen is a DREAM! We appreciate you sharing photos! Thanks so much for allowing us to be a part of your kitchen and bath remodel. Additionally, we can't thank you enough for taking the time to write such a thorough review! Here's hoping you enjoy your remodel for many, many years to come! 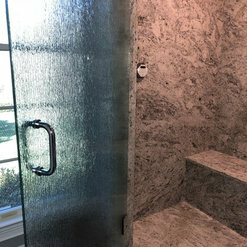 Johnson Granite provided a cultured marble tub/shower and countertop for a bathroom renovation. 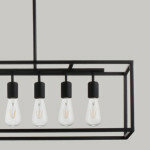 Along with having great customer service, they were prompt with scheduling and delivery. They have a huge selection to choose from at their showroom. 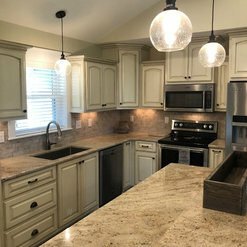 We purchased granite countertops from them a few years ago when remodeling our kitchen and would highly recommend them to anyone. Thank you for the kind review! We are happy to hear you are pleased with how your project turned out, and even happier to know you received great customer service! Thanks so much for your repeat business, and for taking the time to let us know how we are doing! It was our pleasure to serve you! I have had Johnson grate install 2 kitchens and 2 master bathes and am very pleased with the entire process. 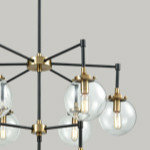 They stand behind their work and the sales and customer service is most responsive to your needs. The templating and installation staff are polite and easy going. I love that installation is one week from template. No waiting. Seams are hardly visible and well matched. Great company and I highly recommend them. True Craftsmanship and integrity are hard to find these days but I found both at Johnson Granite! I have experienced building three houses and renovations on three others, so I've had my fair share of dealings with subcontractors. 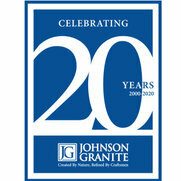 By far, working with Johnson Granite was one of, if not the best experiences I have had. We used Johnson Granite for a second kitchen/bar area when we finished our basement. 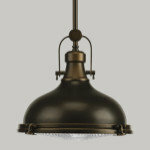 We did not want to use the same company we had used for the main kitchen due to quality and communication issues. 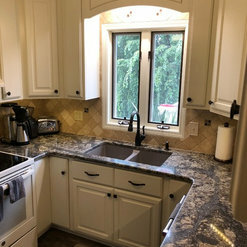 Johnson Granite was able to figure out what granite I wanted from a picture I had taken to them of a kitchen I had seen somewhere else, and they offered suggestions on how to finish off an angled portion of the counter top that had been puzzling us. The space was such that there was no room for error and the counter tops fit perfectly! I can't say enough about how nice it is to have a project done right! Wonderful selection, very patient sales staff. Dates provided for measuring and installing were on target. Installation was perfect, installers were friendly, knowledgeable and paid attention to detail. I would highly recommend Johnson Granite. Joe Shrewsbury reviewed Johnson Granite Inc.
Robert Hobden reviewed Johnson Granite Inc.